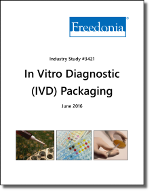 US demand for IVD packaging products is projected to increase 2.9 percent annually to over $3.9 billion in 2020. Primary containers will comprise 63 percent of the market, or almost $2.5 billion. The remainder of demand will be divided among closures, secondary containers, microplates, labels and package inserts, and various other accessories. Over the past several years, advances in reagents and related substances have increased the quality and performance requirements of IVD packaging configurations. This trend is promoting the use of higher value-added containers, closures, and packaging accessories. Nonetheless, the relative cost of packaging to IVD product shipments is expected to decrease gradually, falling to 13.3 percent in 2020 and 13.1 percent in 2025. This slight, but steady drop will reflect efficiency improvements achieved by manufacturers in the design and selection of packaging systems. Companies mentioned include Thermo Fisher Scientific, Becton Dickinson, Duran Group, Corning, and Gerresheimer.